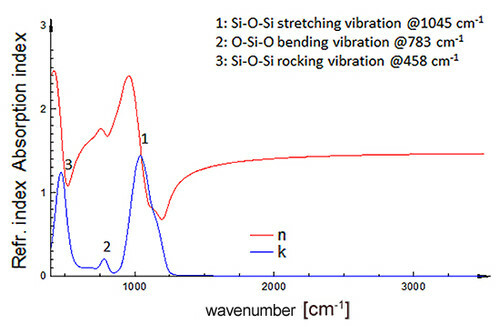 The composition of thin layers is analyzed using the absorption bands Absorption spectrum of a 500 nm thick ICPECVD-SiNx film of molecular vibrational modes in the infrared spectrum. Also the carrier concentration can be measured with this FTIR spectroscopic ellipsometer. To the commercial FTIR iS50 of Thermo Fisher Scientific spectrometer an infrared ellipsometer optics is attached. It is available for general vibrational spectroscopy as well. 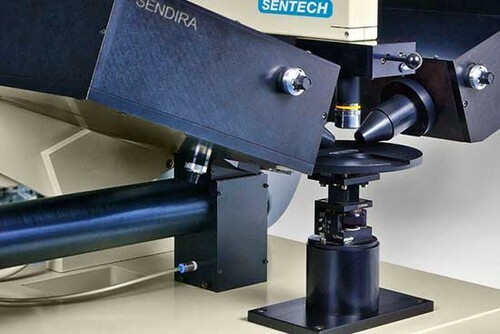 The spectroscopic ellipsometer SENDIRA measures thin film thickness, refractive index, extinction coefficient, and related properties of bulk materials, single layers, and multi-layer stacks. Especially layers below covering layers that are non-transparent in the visible range are now accessible for measurement. Composition of materials and orientation of larger molecule groups and chains can be analyzed. The SENTECH ellipsometer SENDIRA is especially designed for the infrared (FTIR). The compact table top instrument comprises the purged ellipsometer optics, computer controlled goniometer, horizontal sample platform, auto-collimating telescope, commercial FTIR, and DTGS or MCT detector. 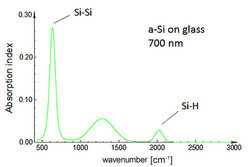 The FTIR provides excellent precision and high resolution in the spectral range from 400 cm-1 to 6,000 cm-1 (1.7 µm – 25 µm). The spectroscopic ellipsometer SENDIRA is focused on the vibrational spectroscopic analysis of thin layers. Applications Applications: Vibrational ellipsometry Measurement of n and k Identification of materials on opaque substrates Determination of crystal modification Composition analysis Determination of impurities Orientation of organic molecule chains Measurement of bond orientation Conductivity of films Doping profiles range from dielectric film, TCOs, semiconductors to organic layers. The SENDIRA is operated by SpectraRay/4 software. FTIR software is provided additionally. The SENDIRA measures thin film thickness, refractive index, extinction coefficient, and related properties of bulk materials, single layers, and multi-layer stacks. Especially layers below covering layers that are non-transparent in the visible range are now accessible for measurement. Composition of materials and orientation of larger molecule groups and chains can be analyzed. The SENTECH ellipsometer SENDIRAis especially designed for the infrared. The compact table top instrument comprises the purged ellipsometer optics, computer controlled goniometer, horizontal sample platform, auto-collimating telescope, commercial FTIR, and DTGS or MCT detector. 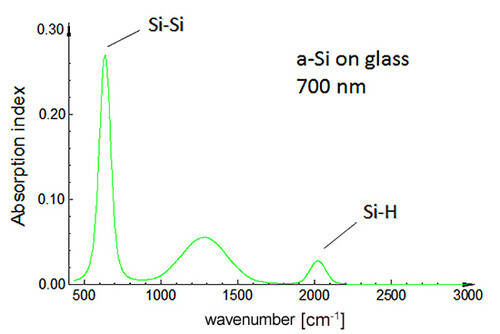 The FTIR provides excellent precision and high resolution in the spectral range from 400 cm-1 to 6,000 cm-1 (1.7 µm – 25 µm). The SENDIRA is focused on the vibrational spectroscopic analysis of thin layers. 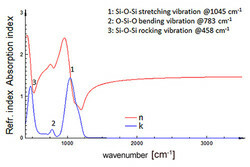 Applications Applications: Vibrational ellipsometry Measurement of n and k Identification of materials on opaque substrates Determination of crystal modification Composition analysis Determination of impurities Orientation of organic molecule chains Measurement of bond orientation Conductivity of films Doping profiles range from dielectric film, TCOs, semiconductors to organic layers. The SENDIRA is operated by SpectraRay/4 software. FTIR software is provided additionally.